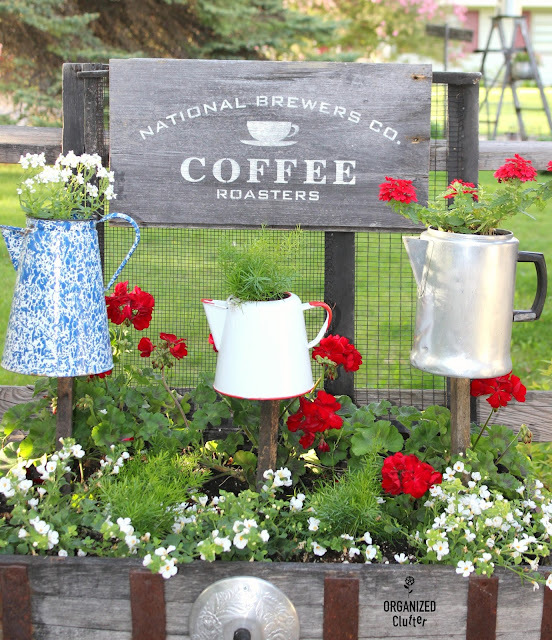 Here are my coffeepot planters from a May 23rd post. Flowers were newly planted. The sign is stenciled with an Old Sign Stencils product. 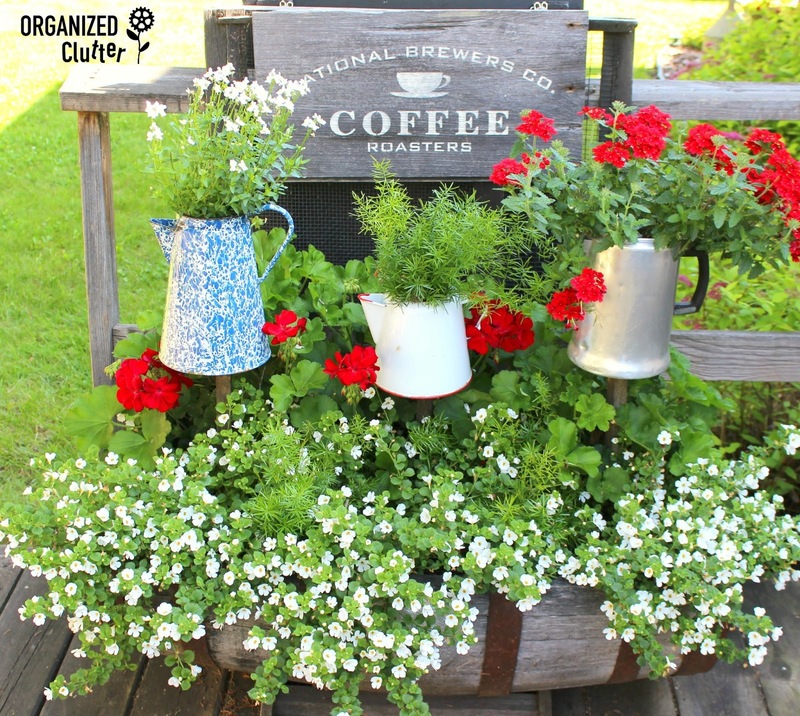 Today on July 3rd, the annuals have all filled in nicely. On June 7th, I posted this toolbox planter with pansy bedding plants. Today, the pansies have grown and are in full bloom. 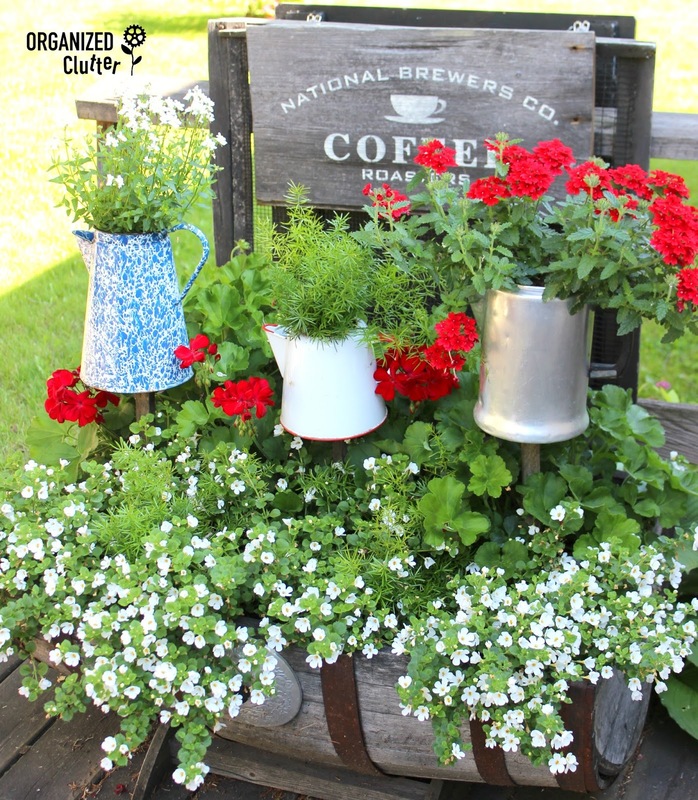 I use about a quarter cap full of Miracle Gro to a 2 gallon watering can every time I water my annuals in pots. This is a tip I received many years ago from a greenhouse owner. She said "Most of the fertilizer leaks out of the holes so you can use weak fertilizer almost daily." If you use the powdered Miracle Grow use 1/2 spoonful to 2 gallon watering can. 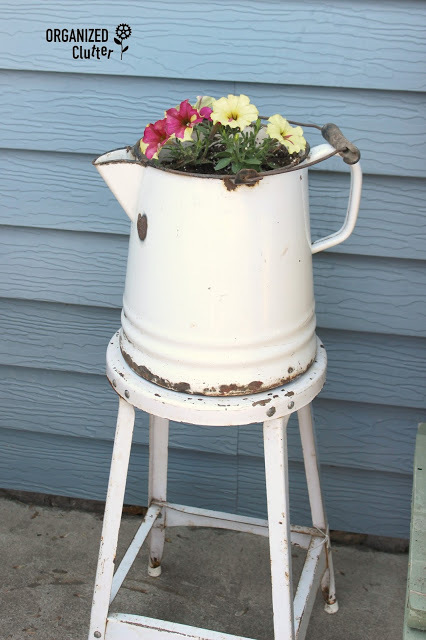 This white enamel stool and coffeepot were from a garage sale on May 8th. 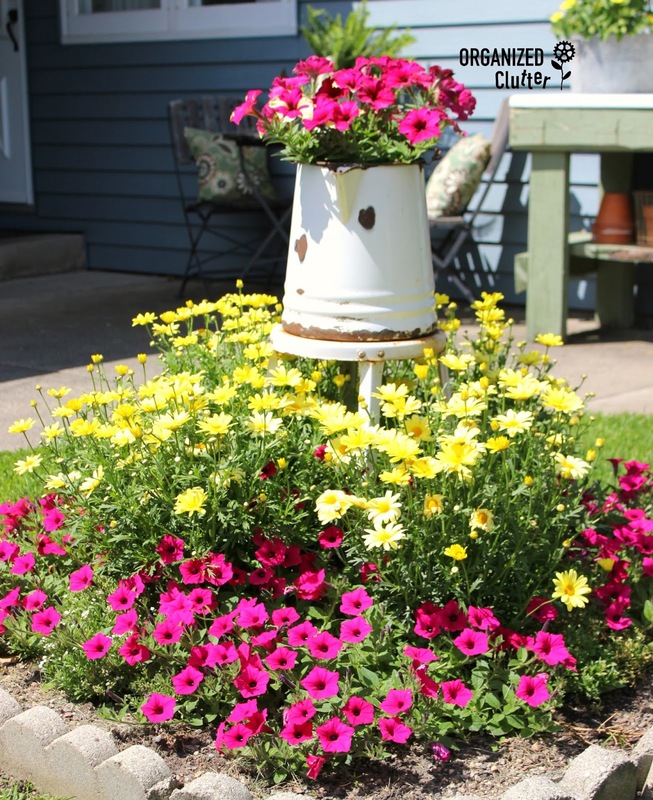 Here the coffeepot is planted with "Sparky" a crazytunia in yellow and hot pink. The variegated "Sparky" crazytunia inspired this garden combination of Fuchsia supertunias and yellow margueritte daisies "Butterfly". As you can see, the Crazytunia is not as variegated as it was when first planted. It seems to me that this has happened to me before with this type of petunia. 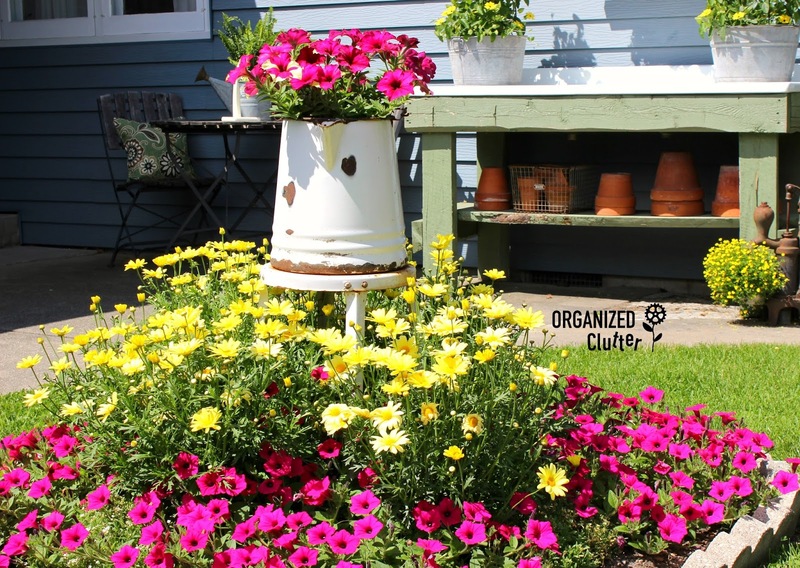 I still like this color combination, and that the daisies cover the legs of the stool! It is a showy display. Gorgeous!! 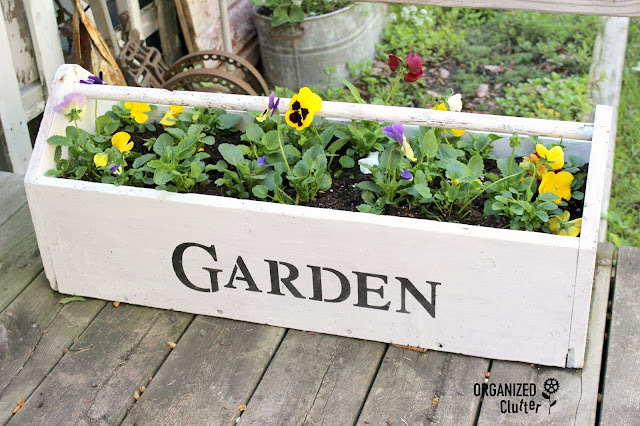 Your gardens look lovely! I just found your blog and I look forward to browsing around and seeing more! Gorgeous display. love it. The color combo is perfect. Great ideas! I love it so much!